Many famous directors have their pet themes, topics they return to again and again in their careers because they’re seemingly never quite finished with them. Martin Scorsese has his Catholic guilt. Hal Needham had his car chases. Perhaps Alfred Hitchcock’s favorite itch to scratch was his obsession with voyeurism. People who surreptitiously watch people, after all, are the most Hitchcockian people in the world. And now, Spanish video essayist Jorge Luengo Ruiz has distilled Hitch’s most peep-heavy moments into a supercut entitled “The Voyeurism Of Hitchcock.” As one might expect, this montage leans heavily on Rear Window and Psycho, since Jimmy Stewart spends much of the former clutching a pair of binoculars he uses to keep tabs on his neighbors, while Anthony Perkins spies on Janet Leigh through a hole in the wall in the latter. Luengo Ruiz even employs Bernard Herrmann’s tense Psycho score throughout the video. 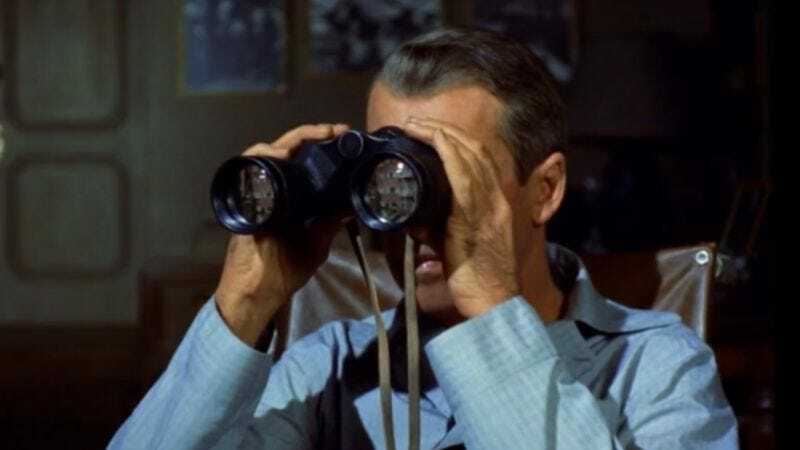 But “The Voyeurism Of Hitchcock” draws from the Master Of Suspense’s entire career, from 1935’s The 39 Steps to 1976’s Family Plot, finding little moments here and there when characters sneak peeks at other characters, hoping they are not caught doing so. As Crow T. Robot once put it, “A heck of a lot of glancing going on here.” In fact, some of the most interesting moments in the supercut are the scenes from Hitchcock’s lesser-known, less-seen motion pictures. Hands down the weirdest shot in all of “The Voyeurism Of Hitchcock” comes from 1937’s Young And Innocent and involves a blackface-wearing drummer who, for a variety of reasons, cannot keep it together during a performance. Hitchcock’s camera is relentless and merciless here, focusing with great intensity on the unfortunate drummer, whose eyes, in turn, remain fixed on what’s happening in the audience. There are several levels, then, of voyeurism going on here.